The idea to brew our own beer was born in spring 2011, likely in a beer mood, by Steffen Gerhard and Mario Möldner. After we met master brewer Ingo Saßmannshausen a while later, we could (theoretically) start then. But brewing beer is not that easy and needs a lot of technical auxiliaries. So first, thanks to Ingo’s good connections to the brewer scene, a small brewing kettle with unbelievable 50 liters (11 brit. gallons) netto output was organized, which needed some modifications before the start. But as the job’s not done with brewing alone, a 200 liters milk cooling barrel and a cold store cell followed in August, to cool down the wort during the main fermentation as well as during the following maturation. Further on barrels were required. So after everything had been organized step by step , we were ready to rumble and the first brew could get started. But stop, not such a hurry, the most important thing is still missing: the registration at the main customs office in Dortmund, to be able to pay the beer tax accordingly. After long 7 weeks waiting, the time had come and the first 45 litres (10 gallons) of dark march beer were finish to be consumed an got directly killed on Alex’s birthday in the neighbourhood. So it continued, everybody wanted to try the beers and we constantly were in a need of fresh supply. Until summer 2012 the old kettle was on duty, in early summer the second beer, the Pilsener has been established. After the first experiences with the old brew kettle, Ingo’s special knowledge about the brewing process and the design experience of Steffen and Mario, concrete plans were growing for the development of a new brew kettle. 200 liters netto output it shall have, to be made from stainless steel and for shure nice and shiny. Steffen was locked up for two weeks in the basement to create 3D models, .dxf data and a complete set of manufacturing drawings, to ensure the new wonder machine to be ready on time for the big party on October 3rd 2012 (German day of re- unification). Cause that day the Sauerland Brass Band was scheduled to come to play fines brass music, an that for sure ain’t possible at all without beer. And so it was that the new brew kettle was ready on time on October 3rd and the first brew of dark march beer was brewed. The new brew kettle was hardly in operation that now milk chiller as well as the cold store cell became too small for the new process, thus the erection of a new icehouse and the purchase of a 650 liter milk chiller followed on the spot. 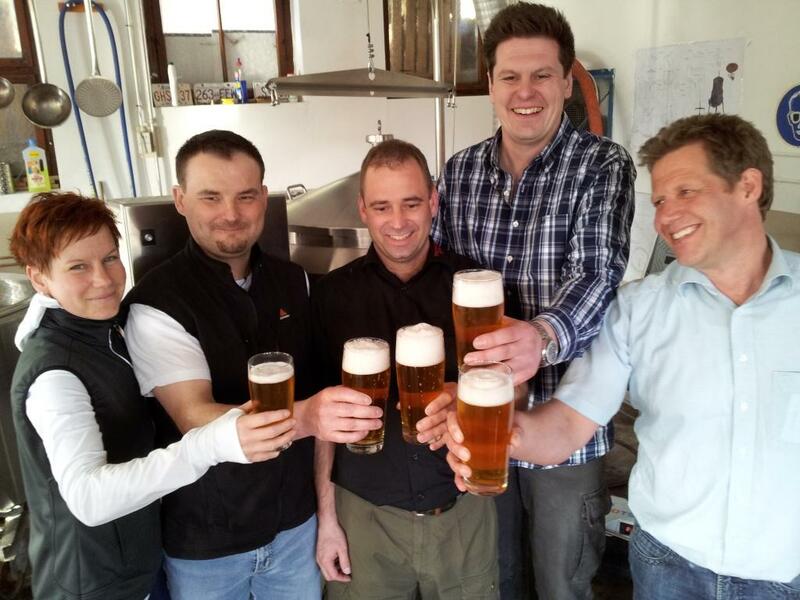 In spring 2013, the international day of the beer, it came that Radio Siegen the local radio station, showed up for an interview and to see what the brewers in the old leather manufactory were doing. As the reports usually came from the big well known breweries, that year they wanted to report about a small craft brewery. That surprised us a lot and was a big honor for our small young brewery. Here a nice pic, taken after the interview. Thanks a lot to Bernd Müller from Radio Siegen.